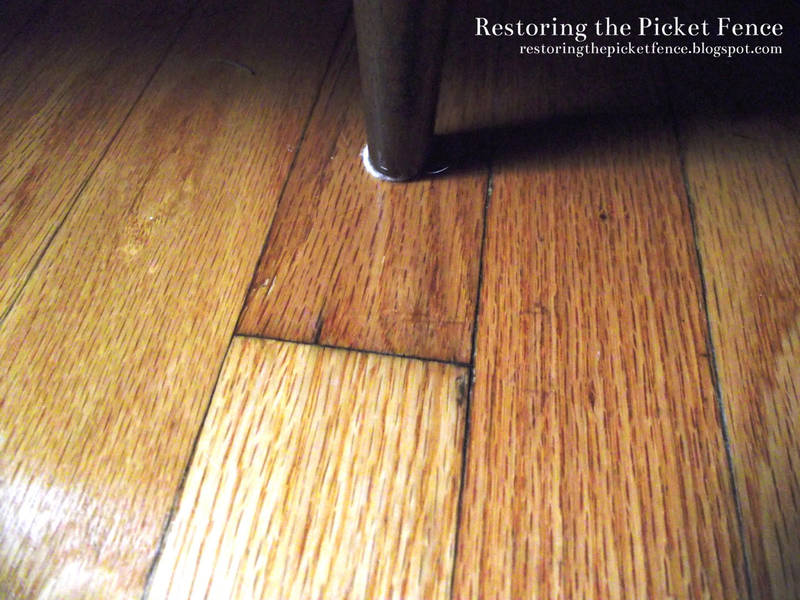 Removing scratches from wood floors. If you own a wood floor and have dogs, kids, cats or have ever moved furniture ... you probably have some scratches on your floor. 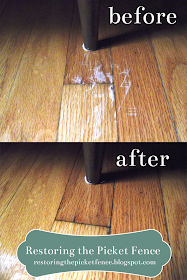 While moving a bookcase from one corner of our dining room, the floor got rather scratched. The new mid-century bar (keep an eye out for a blog post about that!) has exposed legs, so the scratches are pretty obvious now. An easy solution (that I amended per our pantry contents) is to mix one part vinegar and three parts canola oil. I didn't have canola oil and just used vegetable oil. So if you're wondering if you can substitute vegetable oil for canola oil -- the answer is yes! It turned out great! After: Removed scratches from wood floor. Just wipe the solution on and gently rub into the wood. No need to wipe off. I can't wait to try this on some dog-scratched window sills that we have! Do you have any simple fixes? How much of each do I mix? Not sure what "parts" are. "Parts" are the measurement you decide to use; in this case the recipe requires one part vinegar and three parts canola oil. If you wanted make a small batch of the mixture and wanted to use "tablespoons" for your measurement, you would use one tablespoon vinegar and 3 tablespoons of canola oil. If you wanted to make a larger batch, using "cups" for your measurement, it would be 1 cup vinegar and 3 cups canola oil. 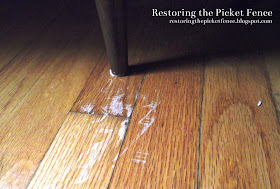 This really worked wonders on my floors, they are 45 yrs old and never been redone. Helped with alot of the scuff marks from years of moving stuff. My dogs also enjoyed me using this on the floors,silly puppies were licking it up after I was finished cleaning. Does it matter which type vinegar should be used? I'm assuming white or apple cider vinegar. I tried this on my floor, and I was very pleased with the results. It really works. Thank you. Does this work for all scratches? Mine are a little deeper than your photo above. Can I use coconut oil or olive oil? Does it work on laminate floors? I would not use it on Laminate. 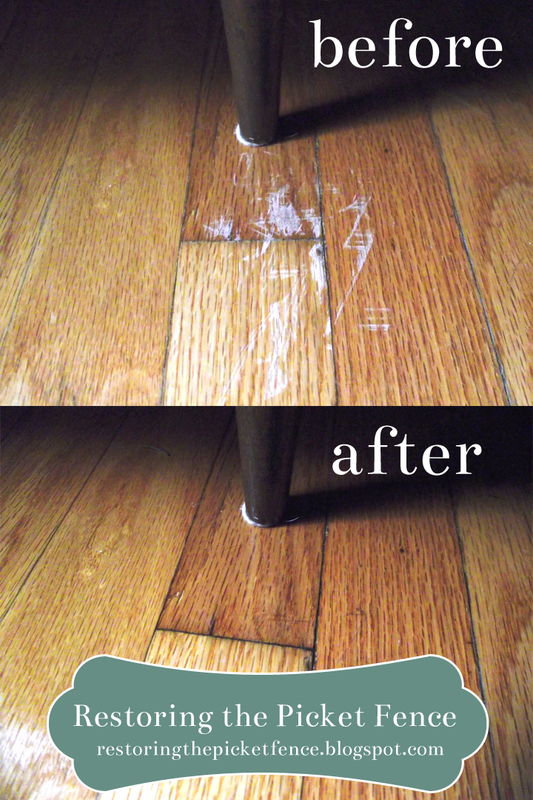 Use the Magic Eraser for laminate scuffs. Scratched in laminate cannot be sanded down or repaired with oil unfortunately. How long till it dries? I have always understood that on wood, vegetable oils should not be used because over time they'll turn rancid. Instead, use mineral oil. 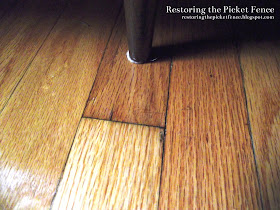 This was the perfect fix for my 100 year old hardwood floors! I have used it several times over the last year with no problems at all. Thank you for sharing! I have recommended this recipe and linked to your site from my blog. Are we talking white vinegar?